Johnson's rarest and most decorative map of New England. This curious map appeared only in the 1861 edition of Johnson's atlas. The previous edition 1861, featured a similar map but without the decorative engraving work. 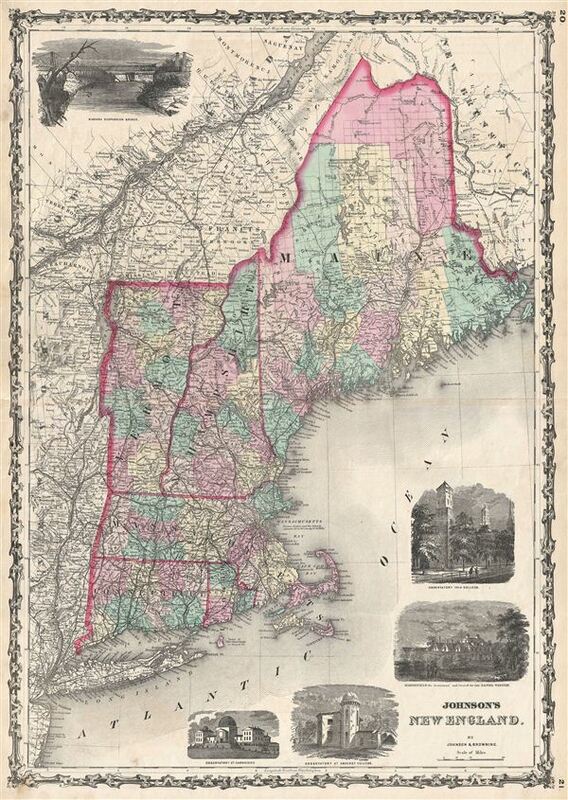 Subsequent editions did away with the New england map in favor of more detail maps of the individual constituent states. Features the strapwork style border common to Johnson's atlas work from 1860 to 1863. Published by A. J. Johnson and Browning as plate numbers 20-21 in the 1861 edition of Johnson's New Illustrated Family Atlas. This is the last edition of the Johnson Atlas to bear the 'Johnson and Browning' imprint. Subsequent editions reflect Ward's 1862 acquisition Ross C. Browning's shares in the firm. Very Good. Minor toning to outer margins. Marginal verso repair to left and right margins, not extending into printed area. Blank on verso. Original centerfold.